Coming of age on an island in Maine informed Sam's aesthetic appreciation for his artwork. 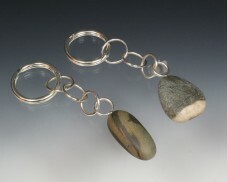 It is not surprising that in 1985 he created a collection of jewelry centered on the delight of wave worn beachstones. His interest stems from the intrinsic beauty and the understandings of the processes that formed them. 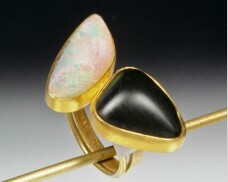 Beyond that, he is very engaged in the duality between precious (gold) and what is generally considered without worth (beachstone). By setting these humble stones in high karat gold constructions, he forces the viewer to consider them as something of value.